Dog owners see their pet as a full member of their family. This means that if they go on a vacation or other trip, the dog goes with them. Indeed, doing so also makes the vacation more enjoyable, as you don’t have to worry about whether or not your furry best friend is being looked after properly. However, traveling with your dog does take a bit of knowledge and understanding, particularly if you are taking your pet in a car. After all, cars are not designed to carry dogs. 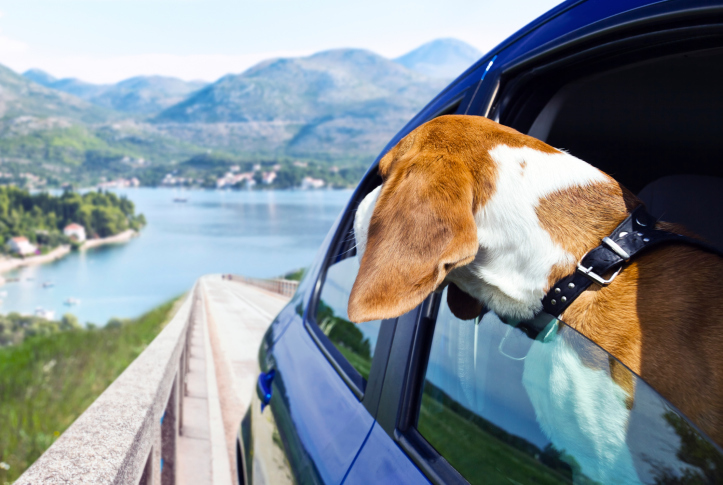 Luckily, you can plan ahead in order to make sure the journey is pleasant for both yourself and your dog. Let’s take a look at some important dog travel tips. It is recommended to crate your dog when you travel in a car. There are a number of reasons for this, above and beyond the fact that it is comfortable for your dog. The most important reason, however, is the safety of your dog and yourself. A loose dog can be very distracting. Additionally, unless your dog is properly strapped in, they could become a projectile if you have to brake hard or are involved in an accident. Needless to say, this could actually injure you and your dog. But what if you have a vehicle in which a crate doesn’t fit, or perhaps you need the crating area to keep your luggage, or you may have big pups like ours that simply will not fit in a crate in the car. In this case, you will need to have your dog in another area of your vehicle and ensure it is safe. One of the options you have is to attach a custom seat belt. Remember that airbags can be very dangerous. Keep this in mind before traveling with your dog in the front seat. Always make sure that the harness is the right size for your dog. One very important thing to remember when you drive with your dog is that you should not feed it just before the trip. Dogs are prone to motion sickness, perhaps even more so than humans. Additionally, they have a tendency to drool a lot during a trip, particularly if they are somewhat nervous. 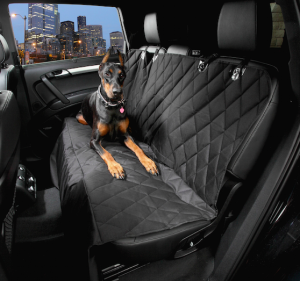 This is why it is also a good idea to have a rear dog seat cover in place, so that any accidents, fur, dirt and drool can easily be cleaned up without any permanent damage to your vehicle. If you are going on a long trip, stop frequently for small snacks and give her the opportunity to stretch her legs. Naturally, you should also make sure that she has plenty of water when you stop. 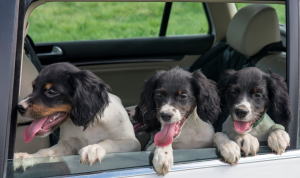 It cannot be stressed enough, as well, that you should never leave your dog in the car when you park it, not even if you leave the window open slightly. It takes only a very short period of time for the temperature inside the car to become unbearably warm and for the dog to dehydrate and even die. Should You Medicate Your Dog? Using sedatives or calming medications for a dog during a trip is a controversial issue. It is not recommended by experts, but if you have a particularly nervous dog or if you are going on a long trip, you may want to consider it. Do not use medication designed for humans, however, and make sure you speak to your vet beforehand. Also keep in mind that your dog may feel sick as a result of the medication, so it is even more important to have a rear car seat cover in place. No matter how well-behaved your dog is, it may get pretty tired of traveling after a while and become restless. Take frequent stops and allow your dog to get rid of some energy. Also, make sure that you have some comfort blankets or toys available.